How do I configure SQL-RD to use SMS (Cell Phone Text)? 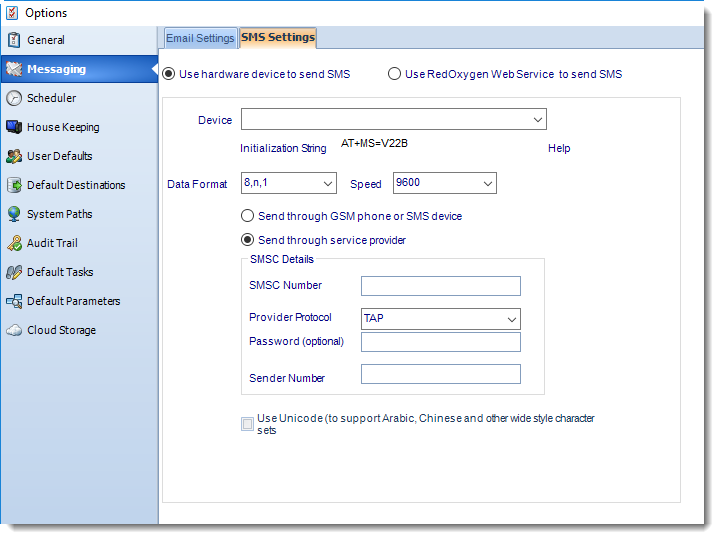 SQL-RD sends SMS messages using three different methods: A direct connection to a cell phone or GSM modem, a modem connected to a phone line, or the Red Oxygen SMS Gateway. Here is how to configure it. Now that you've configured your Email Settings for SQL-RD, let's look at the methods SQL-RD uses to send SMS messages and how to configure your SMS (text messages) settings. Select Messaging and click SMS Settings. SQL-RD sends SMS messages using three different methods: A direct connection to a cell phone or GSM modem, a modem connected to a phone line, or the Red Oxygen Web Service. If you have a cell phone connected to a COM port on your PC, SQL-RD can interface directly with the cell phone and send messages. Information located on this page may indicate that SMS could be received by SQL-RD. However, this function has not been enabled in our software. The SMS component within SQL-RD can only send SMS. It cannot receive and process SMS messages. You can use a GSM Modem or GSM Phone for sending SMS messages. However, we recommend a dedicated GSM modem instead of a GSM phone; a GSM modem is more reliable and faster. SQL-RD supports the majority of the GSM modems available on the market (although we strongly recommend WaveCom Fastrack GSM Modems) and supports most 'business' GSM phones (i.e. GSM phones that support the AT+C command set). Whilst we have provided information here on the phones which have been tested, ChristianSteven Software makes no guarantee that SQL-RD will work with any of the above phones or any other phones. We do not advise or train on the installation of GSM modems and phones. For more information, please speak to your telephone system administrator and refer to the user manuals and manufacturer of your phone or GSM modem. Click Use hardware device to send SMS. From the Device drop-down select your modem or COM port. Enter or confirm the relevant initialization string, data format, and speed. You may find relevant settings for your specific service provider on the SMS Service Provider Information chart located at the bottom of this page. Alternatively, you can speak with your SMS provider or view your GSM modem or phone's user manual. 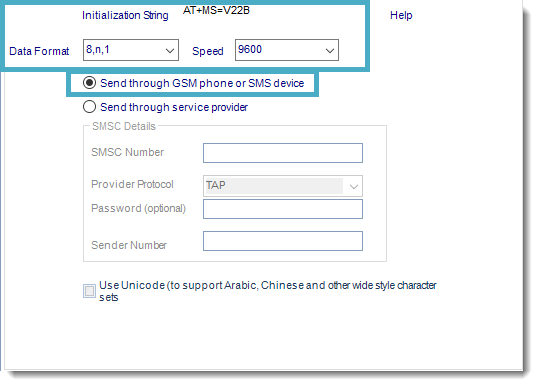 Click Send through GSM phone or SMS device. If you use Arabic, Chinese, or other wide style character sets, check Use Unicode. Otherwise, leave this box unchecked. Click Apply then OK at the bottom of the Options window. Your cell phone company should have provided you with a special telephone number (SMSC Number). When this number is dialed, an SMS device connects to the line, and SQL-RD sends the required information to your provider. 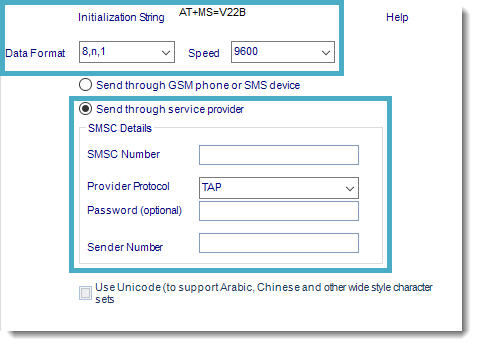 A normal cell phone works by sending texts to the SMSC number programmed in the phone. If you use an SMSC dial-in provider to send SMS messages, you just need a standard Hayes compatible modem. Because SMSC centers operate at low speed, you don't need a fast modem. A Standard 96000 bps modem is already sufficient. When moving through the instructions below, ensure you set your modem to use the speed required by your service provider. Information located on this page may indicate that SMS could be received by SQL-RD. However, this function has not been enabled in our software. Even if this function were enabled in SQL-RD itself, when using an SMSC dial-in provider, you can only send SMS messages. Click Send through service provider. Enter in the relevant SMSC Number, Provider Protocol, Password (if necessary), and Sender Number. If you use Arabic, Chinese, or other wide style character sets, check Use Unicode. Red Oxygen is a 3rd party text messaging provider. If you (or your company) have a Red Oxygen account, it can be connected with SQL-RD to send text messages. If you do not have an account or need more information, please visit Red Oxygen. The most basic plan is all that is necessary in order for SQL-RD to use this feature. However, pricing and plans can vary depending on your required SMS traffic. Please refer to Red Oxygen for further details. RedOxygen is not a ChristianSteven Product and is not supported by our technical support team. SQL-RD is simply compatible with this product. For troubleshooting of Red Oxygen, please refer to Red Oxygen support. 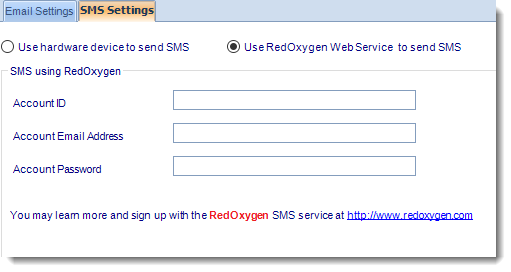 Click Use RedOxygen Web Service to send SMS. Enter in your Red Oxygen Account ID, Email Address, and Password. Click Apply then click OK at the bottom of the Options window. From now on when SQL-RD sends text messages, it will send them via RedOxygen. There are many service providers offering pager/SMS services today. At time of publication, we were provided with a list of service providers and the settings they require. However, we cannot guarantee that all of the service providers mentioned below are working fine, or that SQL-RD will work with your service provider. For more up to date information, please speak to your own SMS service provider.